In the opening sequence of Ravenous we are introduced to Capt. John Boyd played by Guy Pearce. Capt. Boyd is a US soldier fighting in the Mexican-American war who is afraid of dying in battle. When his squadron is over taken he hides underneath the bodies of his fallen comrades to avoid detection. The blood of his fellow soldiers is quickly covering his face and filling his mouth while quietly cries in fear. After struggling for a few moments Capt. Boyd is overtaken by rage and climbs out from the pile of soldiers. We see a man who is no longer afraid of dying. He is powerful and hell bent on killing every last one of the enemy forces single handedly. Capt. Boyd is declared a hero and treated to a steak dinner to celebrate. The way food is shot and the sound of the soldiers eating is enough to turn the stomach of the most carnivorous viewer. Most descriptions of this movie give far too much away. While it is in no way The Sixth Sense, it doesn't hinge on a reveal in the final act. Ravenous is a slow burn and it reveals itself at a deliberate pace. If you haven’t seen this movie, avoid reading the back of the bluray case or the description on itunes. Just take my word for it and watch this delightful little tale. I guess this film would be considered a horror comedy but it’s in no way self- referential or playing it for the laughs. Robert Carlyle gives a manic performance that I cannot get enough of. With so many movies that I will never see, I rarely revisit films on a regular basis. 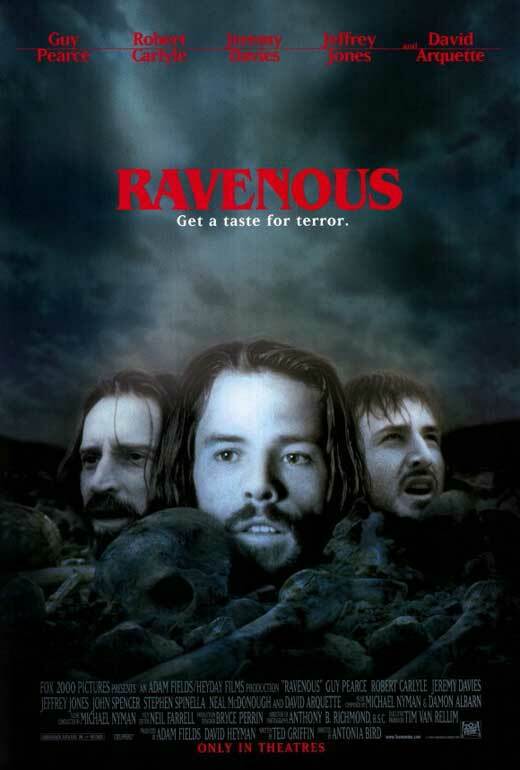 I have seen Ravenous at least 10 times in the past 15 years.